What an age of technology! Twitters, tweets, emails, skype, texts, instant messenger, Facebook… and now I am on Slack! Who knew? Where do we draw the line between keeping up with the advancements and drowning in them? Well, in an effort to keep up, I have taken my business and jumped into the deep end of the pool. And it couldn’t be more invigorating. Keeping up with all the latest bells and whistles incites fear and trepidation for most. 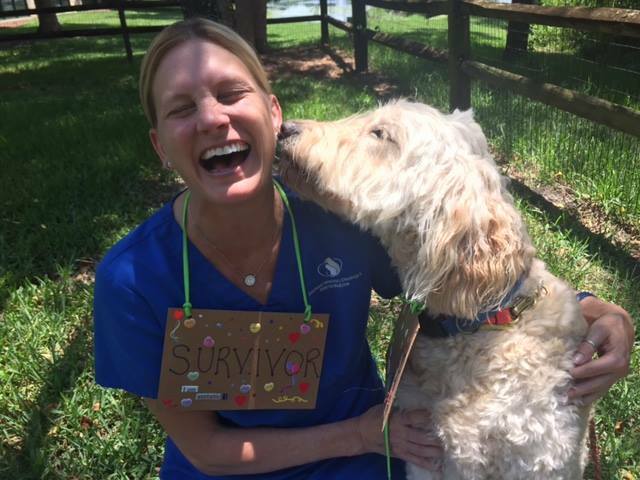 As a veterinary oncologist, the latest bells and whistles means improved survivor outcomes AND less of the side effects that often accompany our cancer-killing methods. Who wouldn’t want to bring that to their patients? 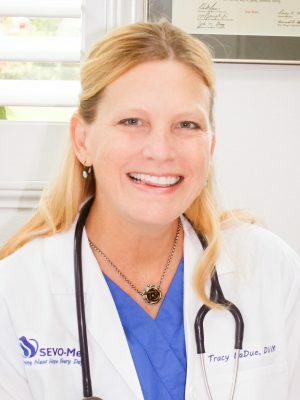 So, with a healthy dose of respect for technology, I am thrilled to introduce Southeast Veterinary Oncology and Internal Medicine (you can call us ‘SEVO-Med’) to the PetCure Oncology family. It is clear that this PetCure family is a team dedicated to the well-being of their patients AND the pet owners who are experiencing this rocky road called cancer. It was very important to me as we investigated this partnership to be sure the mantra wasn’t all about the technology. Bells and whistles are great, but they don’t help a bit when you are the doctor facing a family trying to make the difficult decisions. It still needs to be about teamwork, guidance through decision-making, and the pet’s well-being, first and foremost. PetCure Oncology at SEVO-Med will begin treating cancer patients with stereotactic radiosurgery (SRS) on August 10, 2017. If you would like to schedule a consultation or make a referral please contact (904) 278-3870 or email SEVO@PetCureOncology.com. 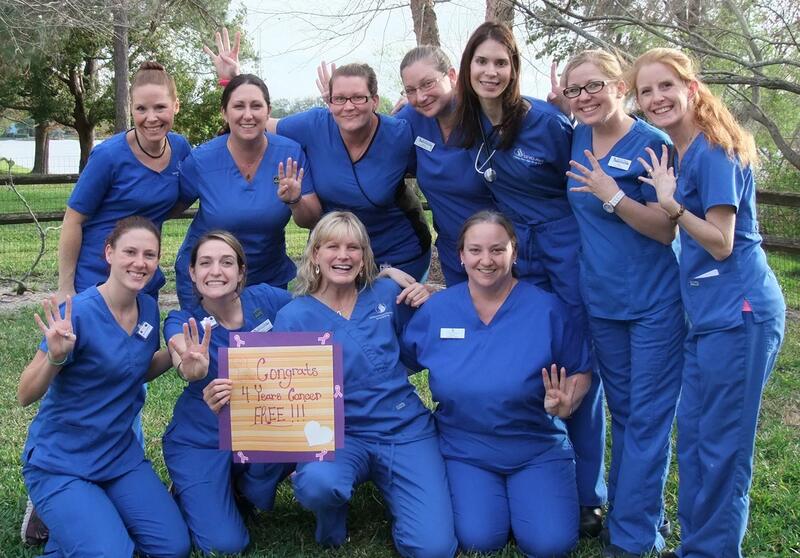 The SEVO-Med team celebrates Dr. LaDue being breast cancer free for 4 years! 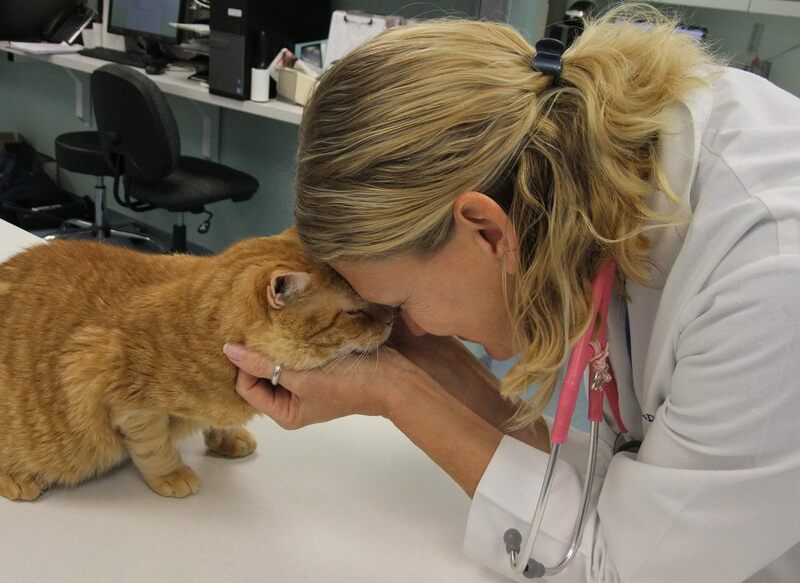 Patient Sunny receives extra TLC from Dr. LaDue before receiving radiation for his tumor. Dr. LaDue receives a kiss from a patient.